“LADAKH – THE HERMIT KINGDOM” PROVIDES AN INTRODUCTION TO LADAKH AND IS A PREFACE TO A SERIES OF SUBJECT SPECIFIC ARTICLES ON LADAKH. In the olden days, in the Hindu way of life, the final stage after the stage of ‘student’ and ‘householder’ is the stage of ‘vaanprasth’ in which the elderly give up their worldly life and retreat to the mountains or the forest to live the ascetic life of a hermit. I have no doubt that if someday I take up vaanprasth, then it is to the Himalayas in Ladakh that I will retreat to. In my 14 days in Ladakh, driving through the rough and harsh greater Himalayas, driving over its great passes, dipping my feet in its majestic chill rivers and flying over its peaks and sighting the many many glaciers that began as rivers but gave up under the wrath of the cold – it is impossible not be magnetised by the Himalayas. I am not a fan of nature. But the ruthless landscapes cast a spell and I know that I will keep returning again and again and again. Ladakh in the 1st century AD was a part of the Kushan empire, and in the 10th century a member of the Tibetan royal family established a kingdom here.The influence of Buddhism grew, until the 13th century when Kashmir and central Asia came under the influence of Islam. It remained independent under many Ladakhi rulers until 1846 when it was annexed and became a part of Jammu and Kashmir. Interestingly, it has never been under the British rule like the rest of India has! Today it is one of the provinces of the state of Jammu and Kashmir in India. It is a high altitude desert – a cold desert – and lies on the edge of the Tibetan plateau or Changthang, nestled between the Karakoram mountain range and the Zanskaar range. Trade routes in the medieval times connecting Central Asia to south -west Asia passed through Ladakh. Ladakh shares boundaries with Pakistan, China and Tibet. Settlements are seen along the valleys created by the two main rivers : Indus and Zanskaar. 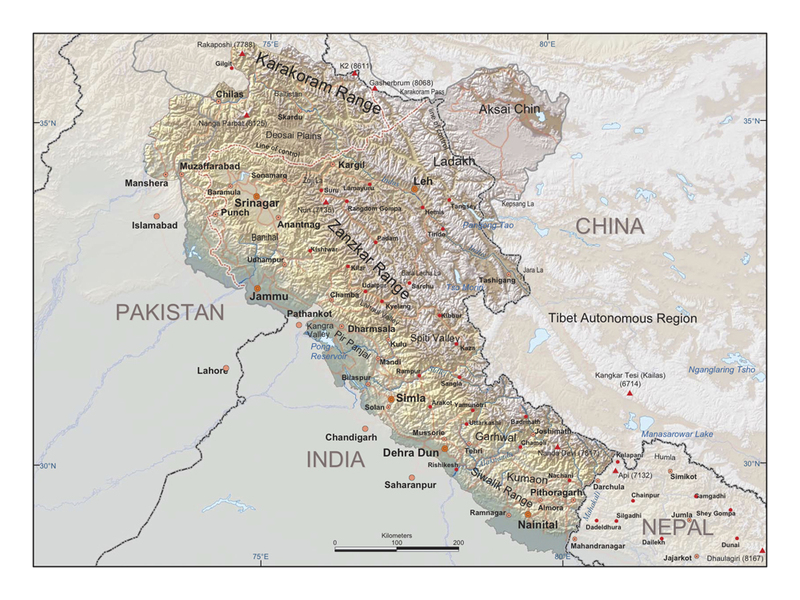 Three basic ethnic groups live in Ladakh – the Dards – the Aryans, the Chang-Pas or the nomads and the Mons – the Indo-Iranians. These are further subdivided based on religion and where they eventually settled. Culturally each group is distinct from the next, but together as Ladakhis they are similar to each other and completely different psycographically from the Kashmiri. This difference is an important one and will be discussed later. In the Himalayan belt, a common flavor of Buddhism developed – that which is seen as Tibetan – in Tibet, in Arunachal Pradesh and in Ladakh. Turquoise and mountain coral are treasured by all. Goncha robes and the typical tigma and nambu work of tie and dyed crosses are common. Of all these regions, Tibet is considered the main cultural center with the other regions being periphereal. I have been to Tibet – Lhasa, and remote towns of Gyantse, Shigatse and Everest Base camp. And I have been to Ladakh – Leh, and remote villages of Puga in Changthang and Hunder in Nubra. If Tibet is 10 on a scale of 10 on the parameter of Tibetanness, Ladakh is probably 20. Because Tibet has been invaded. By commerce. By tourists. By Chinese cybercafes as large as high school auditoriums. An infusion of global culture that has led to at least a little homogenisation with the rest of the world. While Ladakh is still pure. It retains its Tibetanness or Ladakhiness in the many flavors of its daily life. Common men and women are seen wearing their traditional dress in the streets of its main cities. 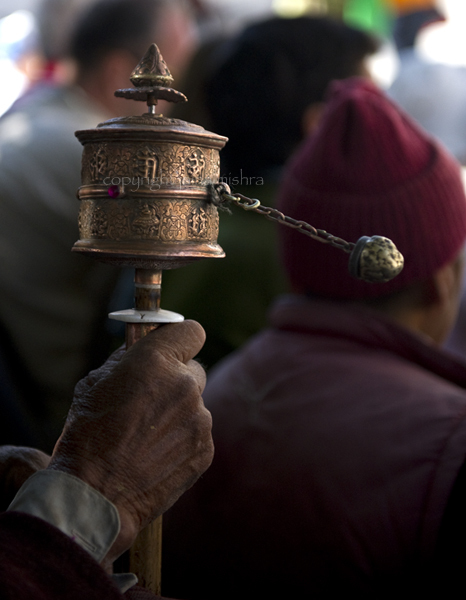 On a 5 minute walk in any street, at least a dozen spinning prayer wheels will be seen in the hands of people. Women still wear their hair in 2 plaits, which join into one at the end. Buddhism is still a very integral and important aspect of the lives of its people. Secondly, the Ladakhi cultural flavor in my opinion is richer, sharper, stronger and much more enhanced than the culture in any other Himalayan region, including Tibet. The visuals and the sounds and the aura leave a much deeper impact on the senses, than any other Himalayan culture I have seen. It is the endeavour of the photo-essays that follow to prove this point that if there must be a hierarchy in the cultural scores of a place – Ladakh would score higher than Tibet. Flying over Himalyan peaks – the most spectacular flight ever! This entry was posted on November 11, 2011 by wovensouls in ARTICLES BY REGION, Culture Kaleidoscope and tagged art photography, Asia, Asian Photography, Blue Veil, Buddhism, Buddhist, Central Asia, Changtang, costume, cultural, cultural photography, culture, dance, dress, ethnic, festival, Folk, folk art, hermit, himalaya, himalayas, india, jaina mishra, Kashmir, Khardung La, kingdom, ladakh, Leh, lhasa, lifestyle, monastery, mountain, Nubra, photo, photo essay, photographer, Photography, Singapore, the blue veil project, tibet, tr, tradition, travel, travel blog, travel photography, travelogue, valley, wovensouls, Zanskaar.